Leave it to Aurelio's Pizza to introduce the King of the Ball Tossers to the wonderful world of lollipops. Who doesn't deserve a DumDum after they eat that tasty pizza?!?! There's no turning back now with these things I'm guessing. 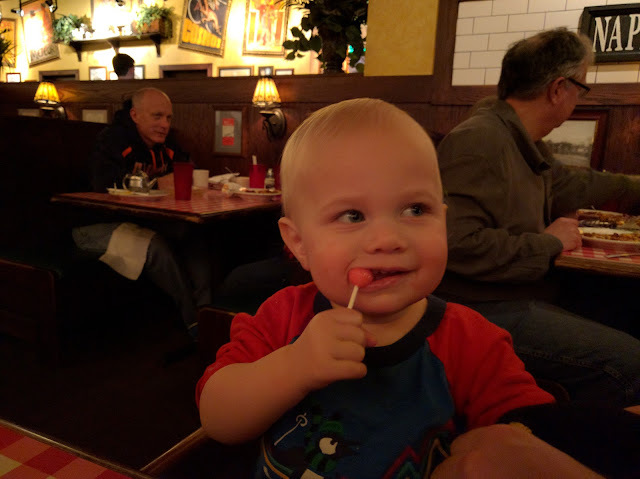 We go to Aurelio's often enough that I'm wondering if he'll remember where the lollipop came from? They have them in a big basket right on the check-in counter and his two older sisters go up there and stuff their pockets with them. He'll soon be joining them I'm sure.